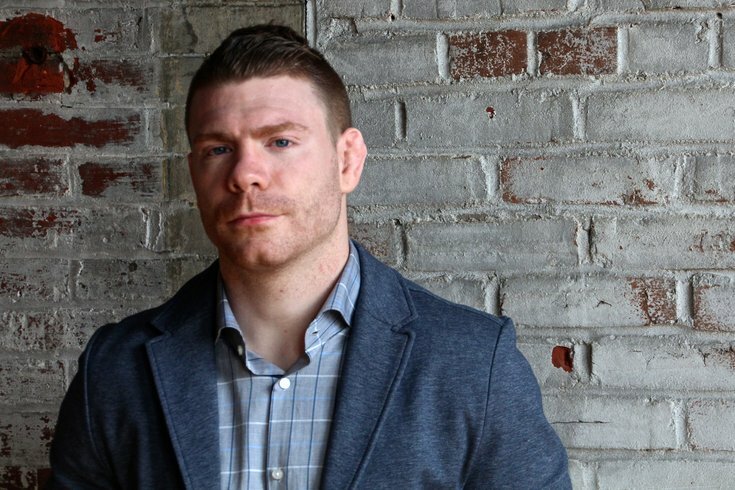 Paul Felder is a bit of a Renaissance man. How else do describe a 29-year-old man who is both a UFC fighter and a trained actor? "University of the Arts. UFC. They don't really seem to go hand-in-hand," Felder told PhillyVoice last week as he let out a chuckle. A 2008 graduate of the University of the Arts in Philadelphia, the Grays Ferry native was an accomplished amateur athlete well before he stepped on stage in front of a live audience. "I started doing martial arts when I was 12-years-old," Felder recalled. "I did karate, taekwondo. Got my black belt, second degree black belt. And I continued doing that all through college. So, I mean, my first passion in life was always martial arts, ever since I was a little kid. Ninja Turtles, Jackie Chan, Bruce Lee. I was obsessed from an early age." "Unfortunately, and vainly enough, that's kind of been the driving force of my existence. 'How can I get more attention?'" And it was more than a passive obsession. Soon, Felder found himself craving more. "I competed on a pretty high level," said Felder. "Junior Olympics in taekwondo All that kind of stuff. But eventually, it just wasn't enough for me. "Throughout college I started doing Muay Thai kickboxing. And then from there I saw people going off and doing amateur MMA fights, and I was like, 'Well, they seem safe enough.'" So Felder took a fight, and remembers thinking to himself, "Yeah, I can do this." That's the same kind of mentality -- I can do that -- that led Felder to acting. "Towards the end of high school, I decided out of nowhere pretty much [to get in to acting]," Felder said. "I remember watching a movie* and thinking, 'I can do this.' So I'm going to do this." *Unfortunately, he doesn't remember the movie. "I just remember wanting that attention," he added, laughing out loud as he realized the truth behind that statement. "Unfortunately, and vainly enough, that's kind of been the driving force of my existence. 'How can I get more attention?'" Originally, Felder tried to find a balance between his fighting and his acting. "I would do a play. Then I would go and do a fight," he said. "And I kept going back and forth, until eventually I had enough pro fights where I was like, 'Alright, this is going pretty well. I'm going to try to make a run at this.' And I haven't acted since." That's because, as Felder puts it, there was "always something driving me back to competing." Even while acting, he maintained that competitive drive, always trying to outdo classmates to prove they weren't as good as everyone thought. Fielder's most recent role was in a production of "Hurlyburly"* in 2013. It came just after his fourth professional fight and his director even attended the match, but not just to cheer on his actor. *If that sounds familiar, it's because it was made into a movie in 1998 starring Sean Penn and Kevin Spacey. Felder played the same role as Spacey, a strung-out actor trying to make it in Hollywood. "I won the fight. And the next day I started rehearsals for a play," he recalled. "I remember the director came to the fight, worried that he was going to watch me lose or get knocked out and then not be able to do the production." That puts a whole new meaning on the phrase "break a leg." Due to the demands of training for the UFC, however, Felder's had to put his acting career on hold. He hopes to be able to use his degree again after he's done fighting -- whether that's doing television work for UFC or acting in a feature film. But if his mixed martial arts career continues down its current path, that day may not come any time soon. Felder celebrates after knocking out Danny Castillo at UFC 182. Coming off a win last month against fellow lightweight Danny Castillo, Felder currently boasts an impressive 10-0 record, although only his two most recent victories came as part of UFC, the sport's premiere fighting league. 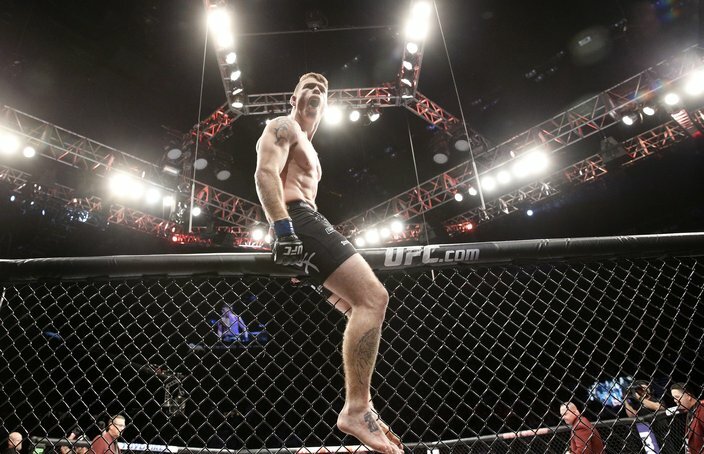 On April 18, Felder -- known as the Irish Dragon -- will face South Jersey native Jim Miller* as part of UFC on FOX 15 at the Prudential Center in Newark, N.J.
*Miller is currently UFC's No. 12 ranked lightweight contender. Considering how close in proximity their training facilities are -- Felder fights out of Philly*; Miller out of Sparta, N.J. -- Felder is well aware of what his opponent brings to the table. *He trains at Daniel Gracie's Renzo Gracie academy in Philly and with fellow UFC fighter Donald Cerrone, who knocked out Miller last July, at the BMF Ranch outside Albuquerque. And after Felder scored an early contender for knockout of the year against Castillo, he almost certainly caught Miller's attention. As Felder said, "The curtain came down early on that one." It's a move that looks like something straight out of a Bruce Lee movie, the kind that first drew Felder to martial arts. And although he said he works on in it practice, and has thrown it before in fights, Felder never landed it with the accuracy or force he did against Castillo. They call it a "spinning back fist" and, well, you have see it to believe it. "Bang. Yeah, he's out," Felder said as we watched a replay of the knockout. "That's unnecessary right there," he added about the couple of punches he threw while Castillo was down. "Right on the jaw." His years of training certainly contributed to the knockout, as Felder said it kind of came naturally, without him even thinking about it. In fact, he didn't even plan on throwing that punch, but rather reacted to the off balance position he suddenly found himself in after Castillo came with a right kick to the ribs. Naturally, Felder was much happier with the result against Castillo than he was with that of his UFC debut, which came by unanimous decision. And even though he loves being the center of attention, the second-round knockout was more than that. "I really wanted to show the fans that this is more me than my first fight," he said while watching the replay. "Putting my strikes together. Putting combos together. Head movement. I was just stoked that I got to show off my kickboxing really." While Felder said he prefers to watch everything that leads up to knockout blow -- mainly to critique himself -- that doesn't mean he can't enjoy watching himself finish off his opponent. "I see it over and over," he admitted, "Because I get tagged in a bunch of memes on Instagram and Twitter, I've seen it a bunch." But that's exactly the kind of attention the Fishtown resident wants. "I like being in front of people live and performing for them. And fighting is that," Felder said. "So I kind of just found a way to kind of combine both passions in my life. Luckily enough for me, it's kind of amazing, I like performing and -- to be honest -- I like fighting. I like getting hit. "A part of that was missing when I was acting. There was still an aggressive, violent side of me that I had to find a way to control. ... It's kind of amazing to do that in front of 15 to 20,000 people." • Philly's Zach Makovsky told PhillyVoice prior to his recent fight against Tim Elliot that he felt like he was due a title shot soon. After beating Elliot by unanimous decision, UFC gave the former Drexel wrestling captain the next best thing: a shot at the No. 1 contender, John Dodson. They'll face off on May 23 at the MGM Grand in Las Vegas as part of UFC 187. • Eddie Alvarez -- ranked one spot ahead of Felder's opponent, Jim Miller, at No. 11 -- will return to the octagon at UFC 188 in Mexico City on June 13 as part of the co-main event. He'll face No. 4 Gilbert Melendez after the two have previous butted heads in the media while talking about a potential bout. After years as one of the top lightweights outside the UFC ranks, Alvarez made his debut in September, suffering a decision loss to Cerrone.